Wearing its Mad Max: Fury Road inspiration on its sleeves, VROOM KABOOM is an intriguing concept. It’s a tower defense game, but it’s also sort of a driving game, and also kind of a card game. You can also play it in VR, because we’re looking at a dart board and firing a handgun at it. This free-to-play/premium game wants you to try it out based on its weird, hybrid concepts, but doesn’t quite have enough oomph to keep you hooked. Here’s why. In a round of VROOM KABOOM, you sit on one end of a long stretch of post-apocalyptic desert road, while your opponent sits on the other. You both have a couple of oil rigs, and because video game, one decides the other must be destroyed. To do this, each side sends various types of vehicles, weapons, and tools out via a customizable deck of cards. Pick a card, toss it out onto the road, and it turns into a rolling death machine, or a dinky little scooter or something. But this isn’t like most tower defense games, where you watch things play out from afar. Instead, you can actually drive the vehicles down the road, and pick up precious resources on the way to the end. There’s also an element of combat, as each vehicle has a trigger ability, and you can scrap with opposing vehicles to a certain extent. Make it to the end, and you can crash into one of the oil rigs to deal some damage. Rinse and repeat forever. The biggest problem out of the gate with VROOM KABOOM is it doesn’t tell you how anything works. There’s a tutorial, but it’s just a battle you can’t lose paired with a list of basic objectives. Through UI control clues and your own context-deciphering abilities, you can figure it out on your own. It would be nice, though, if the card designs were halfway legible. The card designs are a mess, and when you’re looking at your hand it’s impossible to tell what anything is unless you grab a card to use it, especially since unusable cards are darkened. It’s hard to tell what resource you need and how many before a card is eligible for use, and even then it’s tough to tell what a card does or how useful it is until you’re figuring out the vehicle while it’s in play. Of course, when you have a vehicle out, the game shifts to a sort of arcade, car combat sort of experience. Except it’s extremely janky, something that may not come as a surprise at this point. You don’t drive so much as command the car/bike/missile to swap lanes, and it just comes off as awkward and momentum-killing. Trying to collect resources is like sliding a bar of soap back and forth across a ramp. When you’re not controlling a vehicle, the AI takes over for you, so that’s nice, but it sort of defeats the purpose. The gimmick of being both a tower defense and a driving game, which doesn’t end up actually feeling like driving anyway, ends up being too much to deal with, and the mechanics trip over themselves, ultimately making efficient defense play way more cumbersome than it should be. It’s all muddled and awkward, and it just isn’t fun. The PlayStation VR element of VROOM KABOOM is neat for what it is, for what that’s worth. A lot of thought was put into the UI and controls when you swap over to VR, and some aspects of the game are actually easier and more comfortable to deal with. Being able to wave two PlayStation Move controllers around to play cards, use abilities and select lanes to swap to all feels much better than fumbling with a DualShock 4. The UI even looks a bit better, and it’s slightly easier to tell what’s going on. That said, it’s only an improvement on an already frustrating experience, so we’re still dealing with an uphill battle here. With that, we’re back where we started. VROOM KABOOM has big ideas, but I don’t think it’s a matter of execution. I think these ideas are just disparate enough that it makes putting them together naturally problematic. It’s sort of like the opposite of peanut butter and chocolate. Putting a gun on a car is a pretty good idea, but trying to drive three cars while managing a card deck, paying attention to what the opponent is doing, and accomplishing objectives is just too much. 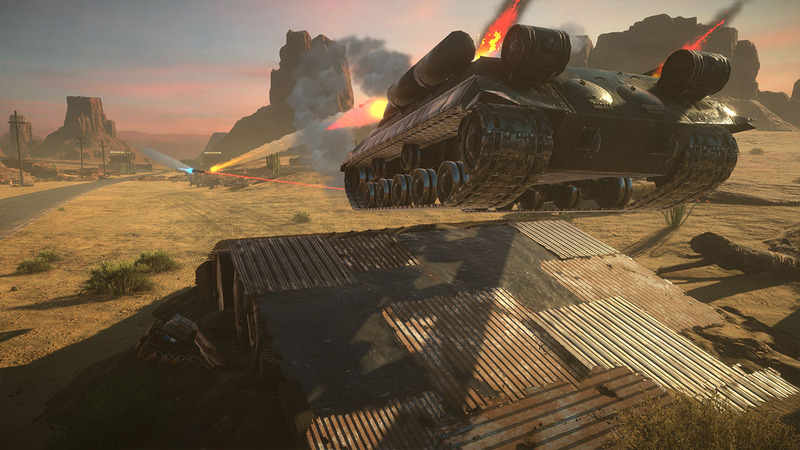 I would happily play a Mad Max-inspired tower defense, or a competitive, on-rails car combat game, but both at the same time is not a great fit. VROOM KABOOM review code provided by publisher. Version 1.01 reviewed on a Standard PS4. For more information on scoring please see our Review Policy here.